Hello and thank you for coming over to another edition of Funny Names in Food. For those who’ve been round before, it’s great to see you again. And for any newbies, I’ll introduce myself as Liz, weekly poster at food for fun and monthly guest here at Blog of Funny Names. I love that you’re here and would invite you to sit back as we talk funny names and CANDY. First, let’s offer you something to drink *liz offers a tray of your favorite beverage* and then we’ll start talking sweets. Ready? If you celebrated Easter a few weeks back, I trust your Easter basket may be nearly empty by now. Perhaps you’re feeling the need for a bit of sweet, so let’s talk Peeps®. Folks seem to fall into two Peeps camps: lovers and haters. Those of you who have read my blog know where I fall. My fascination with all things marshmallow means I’m all over the Peeps. Brightly colored marshmallows–we’re talking shades not found in nature–coated in crunchy sugar. What’s not to love? While Peeps appear year-round in candy sections as edible Christmas trees, Halloween ghosts, and Valentine’s hearts, it’s the Easter ones that rule my heart and company sales. Besides giving a quick hit of sugar and nice bit of texture (whether soft and fresh or “aged” and a bit chewy), they’re delish on s’mores and even better: great fun to watch expand in the microwave. So the Peeps, then. Who are the brilliant peeps who invented Peeps? Just Born Candy Company has manufactured Peeps for over 60 years. And Just Born was birthed by Russian immigrant Sam Born. Born made a name for himself in 1916, when he developed the first machine to mechanically insert sticks into lollipops. (How cool is that?) He was heralded as a confectionery genius, so it’s no surprise that he built a beauty of a candy company. In 1953, Just Born acquired Rodda, another candy company that owned a small line of “3-D marshmallow products.” (The funny-name gods were smiling on me when I learned the Peep’s first inventor had the fantastic Dukes of Hazzard-style name, Roscoe E Rodda.) Back in the day it took 27 hours (!) to create one Peep as each bird was squeezed out of a tube, then painstakingly decorated by hand. Enter Bob Born, Sam’s son. Born junior invented a way to “mechanize the marshmallow-shaping process.” (These quote marks mean I have no idea what I’m talking about.) 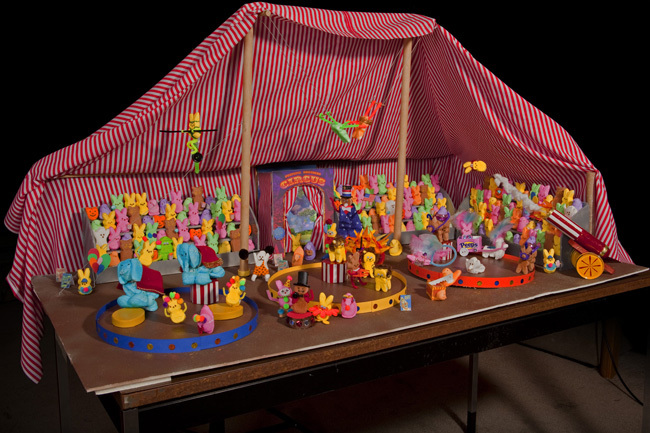 Today’s Peep factories spit out one of those ‘mallow bombs in just six minutes. 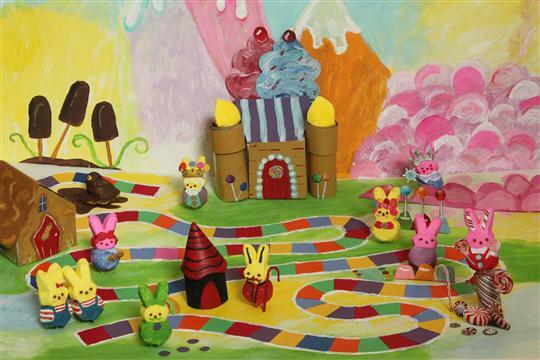 Two million Peeps in a day with about 700 million being produced in a given Easter season. Wow. Photos of Born, Born, and Roscoe didn’t excite me as much as those of candy, so we’ll close with the crazy ingenuity Peeps inspire. 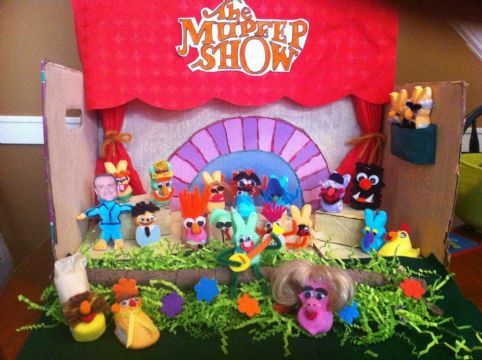 These dioramas were put together by what we can only assume are Peeps lovers. Enjoy! And feel free to dig into your Easter stash while you do so. Peep anyone? Entered in a 2013 Smart magazine Peeps contest. This entry was posted in funny names in food, Uncategorized and tagged candy, deLizious, entertainment, food, food for fun, humor, humour, Just Born candy, marshmallows, Peeps, sugar, sweets. Bookmark the permalink. Didn’t they just announce they’re making a Peeps movie? What a topical post! I hope Misters Rodda, Born and Born are prominently featured in the film. Good fun, this post! Aren’t you the same person who noted that you’re so far out of the loop it looks like a line to you? (or some such phrase) And here you are knowing the latest in popular movies. I had no idea, but googled and sure enough. Though seems the natural next step after they’ve made a movie about Legos. I’d go see it. And woohoo on the HOT CHICKS! reference! (I like how we’ve made it a thing to put that term in all caps). Yes, that was I. I suppose I do keep a close eye on marshmallow-related film announcements, I mean, someone has to. Speaks even more to your proper good timing! Hope those HOT CHICKS don’t end up in the microwave, that would just be too much. Arto Arto Arto, don’t you see? The microwave is WHY they are hot. Without those electromagnetic waves (is that what they are? just guessing), they’re just room temperature chicks. No caps. I heart this entire comment thread! Up to the spectacular standards we have come to expect from Liz! 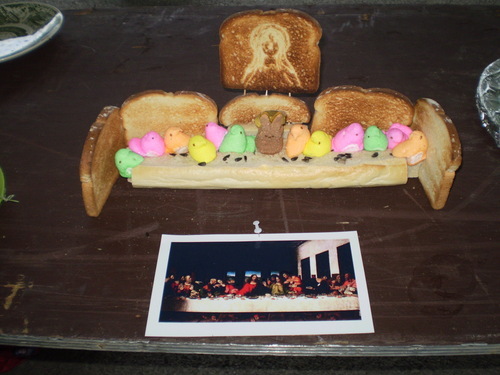 Nice Santana there with the Peep roast. By giving us a history of the Born identity you’ve certainly demonstrated the Born supremacy and you’ve made such a great case for Peep appreciation that this post will stand as a kind of Born ultimatum. Wdydfae–I can’t imagine a Peep looking like Matt Damon, but that would be a movie worth seeing. But I’d never eat another Peep again. . .ever. A star is . . . Born. Wow! So much goodness in this post – amazing names, awesome engineering stories, personal anecdotes, exploding Peeps in microwaves, a “Tags” section that doesn’t encroach upon the image gallery (for the uninitiated: Liz and I exchanged messages last night about a weird formatting issue that she seems to have resolved), Peeps dioramas, “mechanizing the mushroom shaping process,” the name Roscoe, and a long-awaited “HOT CHICKS” reference by Liz, haha! The “hot chicks” (er, I mean HOT CHICKS) thing came to me after the fact, but I thought it was pretty important. And the Tags sorted themselves out, then, if you didn’t do anything. And you DO mean “marshmallow shaping process,” yes? No mushrooms here. Unless diddy brought some magic ones in? And right, who doesn’t love saying Roscoe? Haha, I do mean “Marshmallow shaping process.” Thanks for the catch! And you gave me a great idea for my next Monday post – I could cover Roscoe Conkling – a senator from yesteryear whose name I’ve always been fond of! Thanks for picking up the slack! Usually I can get some blurbs going but I can’t seem to make it happen anymore and this post really deserved a bunch. I managed one blurb for Fannie (one!) last week and it plain tuckered me out. It’s a sad day for blurbing. Haha, you’re so hard on yourself! It’s a splendid day for blurbing – your blurbs have been so influential that I started blurbing for you! It’s like when your business ideas are so good that they start generating passive income – you’re generating passive blurbing returns! P.S. Want to take a stab at guessing my favorite beverage? beergarita? 😉 (really, they’re quite good: http://www.drinksmixer.com/drink10939.html) But serioulsy, I totally know this one: Gordon’s Breakfast. Wow, I’ve never tried that. You might actually be right, though. I tend to default to Moscow Mules (which was the answer I was going for), but at classy establishments that have the necessary ingredients, I totally prefer the Gordon’s Breakfast. I can’t believe that one didn’t come to mind! I had that little fact hidden away in my facebook messaging archives. I’m big on the moscow mules, too. But switch the vodka to bourbon (pappy’s brand?) and you’ve got yourself a kentucky mule, even better. Clearly we need to have a cocktail party–the lot of us. Everyone’s invited! Yay! Some day we’re going to totally make this happen! Arto’s fond of the Kentucky Mule (sometimes I swear the guy was born as a 50-year-old American who just happened to be transplanted to Finland), and perhaps I’ll have to start trying Kentucky Mules too. I was going to say gimlet? And I’ll put Beergarita on the list for sure. Never tried one, but sounds awesome! I’ll also have to get around to drinking an Arto’s Igloo too – if I end up settling in Cleveland, then I’ll have enough snow to make it happen! 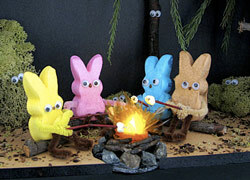 And since you mentioned it, I’ve never had a Peeps s’more. This must be remedied. Totally yes on the bounty hunter. Perfect! You read Stephanie Plum, then? Though that’s a Ranger. I still only get Roscoe P. Coltrane out of it. I just remembered there was actually a guy named “Peeps” but it was spelled Pepys. He is famous for his diary of London life that became a classic of period literature. I never knew it was actually pronounced that way – I just thought my crazy Russian statistics teacher was being crazy (because he often was). Good to know! He seemed like an a$$ to me, though that was through my 21st century liberated woman’s eyes. He may have been quite a catch back then. But his wife had a sad life. Didn’t know the last name was pronounced like the chicks. You’re full of information. Cool! I never read Pepys, I just know his diary is a great source of information about the plague and the great London fire. So is hers, though it made me sad to know the journals were real. Women were so second-rate back and men did as they pleased. Also losing so many children at childbirth or in infancy, though I think they were childless but not by choice. Tough times. Would be interesting to read hers and his together. She mentions him finding her notes and journals and flying into a rage, ripping them up. Good thing she kept multiple copies. So, ole Pepys was a pee-pee head, huh? I would never rip up your diary, Liz. And I would only fly into a rage if you stopped posting. pee-pee head is my new favorite derogatory name! You’re smooth with the praise, diddy. Mrs. Pepys gave as good as she got–spirited lady. Thinking the Mr was just an overgrown boy. Now am curious about his diaries. Speaking of cultured things: Just got Top Secret from netflix–ordered it after the comment thread where you posted the band clip. Looking forward to a blast from the past. It’s easier than saying Pepys-Pepys head. Top Secret is a scream, though the vulgarity index is kinda high. I’m still mesmerized by that video of lava flow peeps, morphing into Jabba the Peeps. And really “Just Born” doesn’t make me want to put anything in my mouth. Not even sugar. It’s a good thing they don’t sell ketchup (or catsup, if you prefer the wrong way). Looking at those dioramas was like a PEEP show. Ha ha ha–I just woke up from a 3 hr nap–so I’m trying. I did see on Food Network only two days ago, their Peep Representative was showing how they now put the chocolate coating on the bottom of the peeps, to give chocolate lovers a Peep option. Quick story: I was looking at pics of my friend’s dad, who seemed to have a Coors Lite can in every shot, with long 70s Vinnie Barbarino hair, and I said, “Your dad looks like he’d have a dog named Roscoe.” And a few minutes later, she sent me a pic w/ him and his former Bassett Hound. Named. Roscoe. Boo-yah! I love it when stereotypes come full circle. Great post, Liz. Very cool you’re watching Peeps on FN. Knew you had class. This is the second time a funny food name has turned you off (remember Chef Gagnaire?). Perhaps you should skip these posts. And yes, it’s ketchup–duh. Awesome Roscoe story. Still, he’ll always be a bumbling, dim-witted sheriff to me. LOL it was a miracle nap. Should I ever have one again, I will term it the Gilligan Nap. You are clever. Not kissing to be clever, like Boy George, but still. Gagnaire is awful! I agree with Beth, I love the dioramas. And the microwave induced, Peep expanding universe. Clearly, you were born for this post. puns puns puns! Whoo hoo 🙂 Check out my above link to Beth for more diorama action. Thanks for coming by, Fannie. And expanding MY pun universe. Yes, Liz, exactly. We had these kind of Peeps Diarama contests yearly and I loved to judge them with my peers. Hey! Peers is only one letter off from Peeps! hey, good call on the peerpeeps. peeppeers? Back to your pinball movie thoughts: you are already thinking plot, so good call on that. And I would expect your dear wife Karen to co-star. I will make the food for the green room.